New players in the joint use arena are racing to deploy services. Utility poles once stood tall under the weight of power and telephone lines alone, but today’s joint use infrastructure now must also support dozens of competing broadband companies. Today’s aging U.S. power and communications infrastructure is strained under a modern “Race to Attach” mentality. The danger that this structural strain causes is seen on utility poles, specifically in the rapid erosion of safety guidelines to make way for faster deployment. 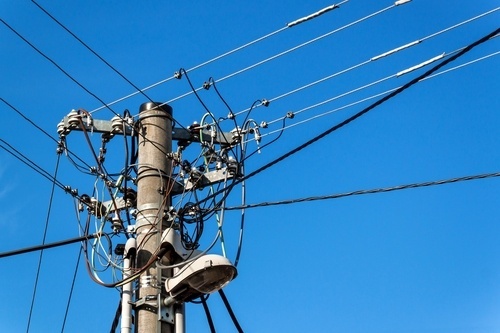 One of the most fundamental safety recommendations by the National Electric Safety Code (NESC) is the separation of supply space (power distribution) and communications space on utility poles. Space on utility poles is increasingly becoming more crowded, which could eventually lead to overloading if not closely monitored. 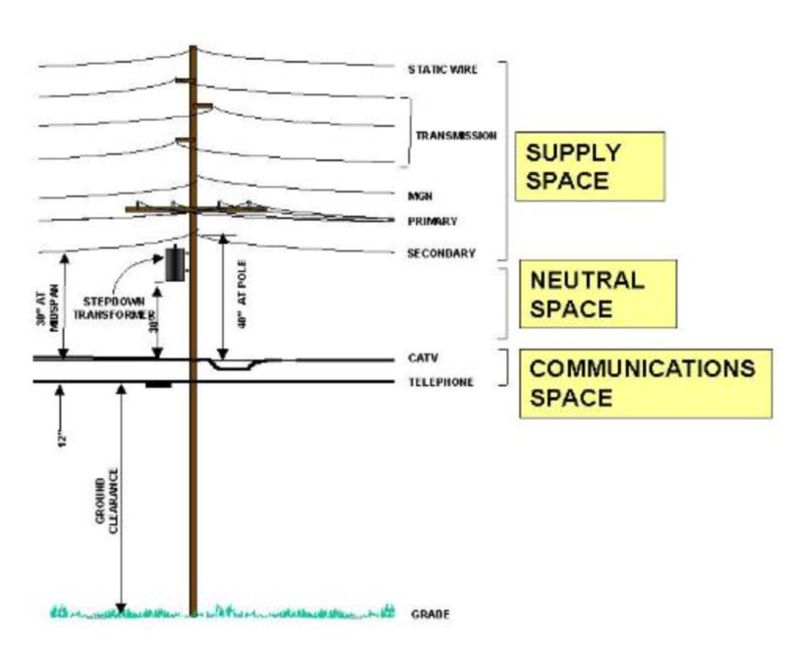 This illustration shows the location of the supply space and communications space on a utility pole. Supply space (or the electrical supply zone) is located in the uppermost area of a pole, where electrical equipment (including electric distribution cables, transformers, and capacitors) is found. Supply space wiring may include different voltages, and often consists of non-insulated conductors. For safety reasons, the highest voltages are in the highest position on the pole. Only authorized electrical workers can work in or above the supply space. Neutral space (or the safety zone) is unused space located directly below the supply space. It exists primarily for safety. Measuring a minimum of 40-inches high, the neutral space is specified by the NESC to protect communications workers from dangerous voltages and to separate communications conductors from electric supply conductors. Communications space is the lowest space on the pole and is located directly beneath the neutral space. Attachments in this space include cable, broadband, fiber, telephone, traffic-signal control wiring, and more. Below the communications space is a mandatory minimum ground clearance, which varies from 8 feet over a pedestrian way to 27 feet over a railroad. Back in the day, when there was ample space on the poles for everyone, the separation between supply space and communications was well-defined. However, with the influx of technologies from wireless to DAS and CATV to smart switches, combined with the drive for nationwide broadband access, the crowding on poles is pushing the parameter of each space; the race is creating greater risk for pole workers and the public. The equipment is sometimes placed on extensions that are added to the top of a pole to provide extra height and enable line of sight. Heavy equipment and extensions can cause load problems. These types of attachments require two wires for power and data connection that must cross through the energized electric portion of the pole down to the communications section below. Minimum Height: The minimum height over the ground (above which all attached cables must be hung) ranges from 15.5 to 21 feet, depending on the type of road or crossing. Communications Worker Safety Zone: To keep workers safe, the NESC requires 40 inches between the lowest energized electric line and communications cables/equipment. This violation can pose a danger to communications workers, who are often contractors with limited training. Boxing the Pole: Attachments may only be located on one side of the pole to allow line workers to climb the pole if necessary. Equipment placed on both sides of a pole is called “boxing,” and this prevents line workers from climbing the pole to reach the electric working space. Clearance and Strength: If there is not enough ground clearance remaining, the last installer should cover the cost of replacing the pole with a taller one. Some companies try to avoid this, often leading to improper attachments violating clearances. Skipping Poles: Attachers, or renters, are required to connect to every utility pole sequentially, but they sometimes skip poles to save on fees. This can lead to sagging comm lines and extra stress on the poles. As demand increases for broadband, companies will be vying for space on existing poles in the future. It is critical that the supply space and communications space on poles be respected and that the current safety recommendations followed while this “race to attach” continues. Have you noticed consequences in the field from the “race to attach”? We would like to hear about your experience—what issues have you seen? Share with us in the comments section.